My daughter came home with an assignment to interview a parent about 9/11. Anyone not comfortable with the assignment could pass. Lucky for me that, although the subject gives me a lump in my throat and makes my heart race, I didn’t have to pass. when she was only 3 months old, new to the world, and her mother wondered how she would raise a baby with so much hatred in the world, and her mother worried that life as she knew it might never be the same. 1. Why do you think the terrorists chose the World Trade Center? 2. If it were up to you, would you have the towers rebuilt? 3. Have the events that took place on 9/11 changed your life? How so? 4. During the months immediately following the attacks, a lot of people sported American flags on their cars, t-shirts and houses. Why do you think that it takes an act of terrorism to bring a country together? Why aren’t we united and patriotic like this all of the time? I’d love to hear your answers to any or all of the questions. 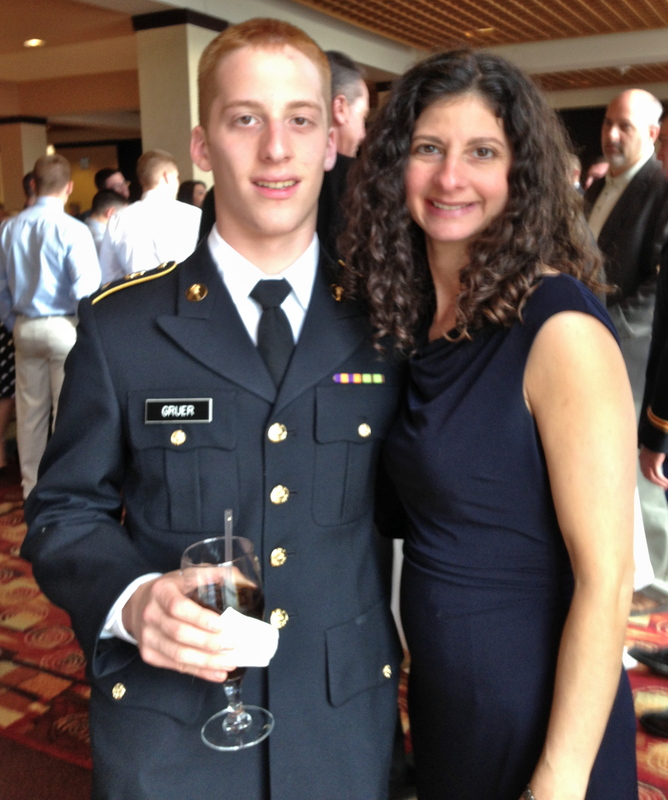 My son and me at an ROTC dinner. 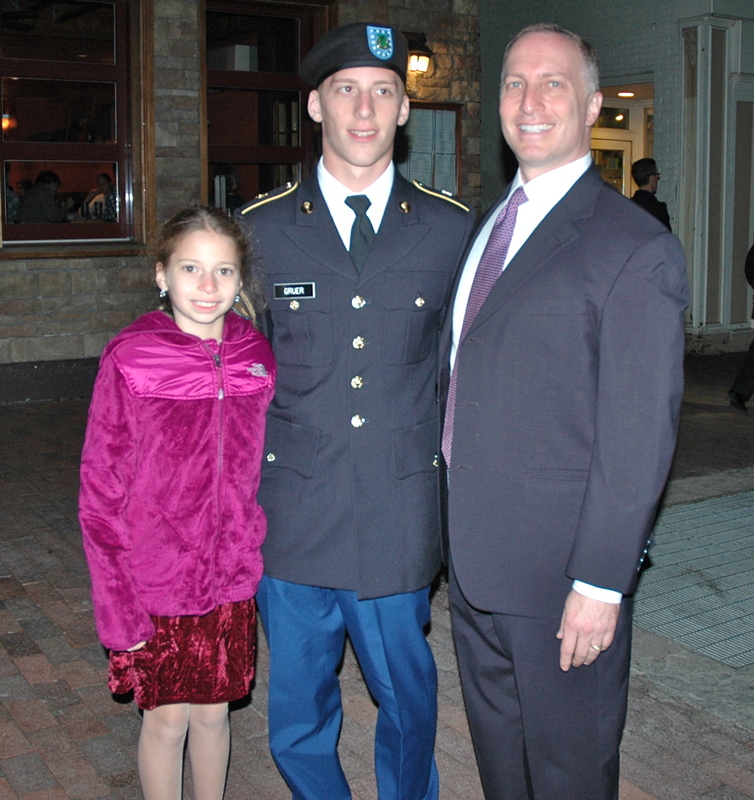 Proud Dad and sister flank our Army cadet. I appreciate your thoughtful comments! 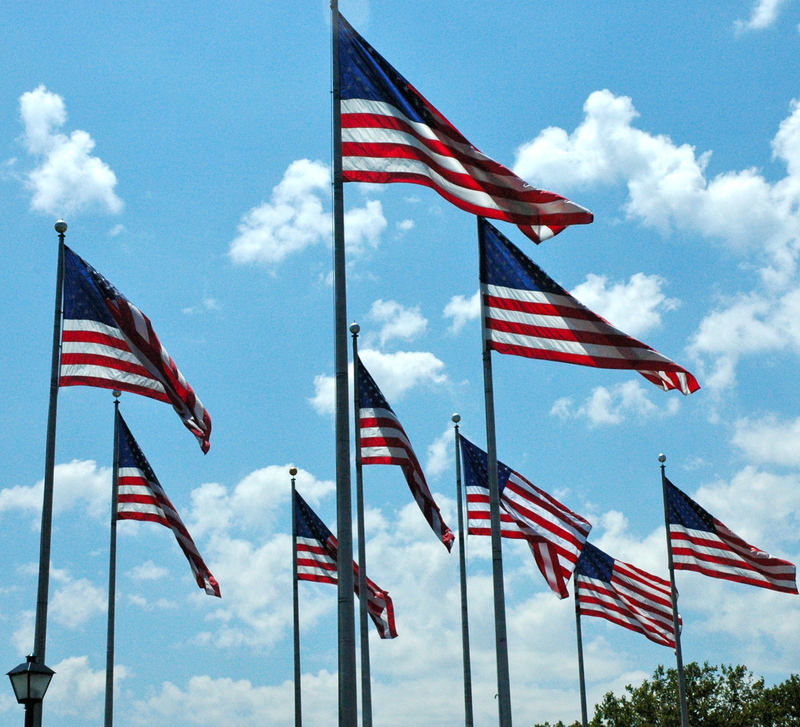 I also loved the patriotism post 9/11 because it felt as if we were more united as a nation. On the one hand it’s too bad that pervasive feeling wasn’t sustained and, on the other hand, the freedom to have many different political, religious and lifestyle views is what make living in the U.S. appealing. It’s great to know that people, however they feel about the military, support soldiers. How different it was for those soldiers who returned from Vietnam. I’m definitely going to check out your post. What a challenging and powerful assignment! 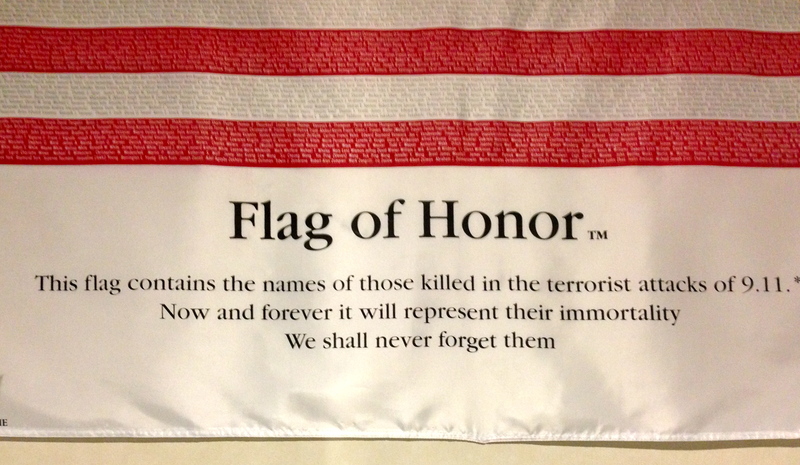 I will say, I loved the patriotism we all experienced in the days and months post 9/11. It’s sad that it has not remained with us as strong and steadfast as it was. We are a fickle nation, constantly moving, looking for the next trend, the latest and greatest, the next best thing. I’m a child of the ’70’s, teen of the ’80’s, college girl of the ’90’s, and for some reason (parents experiencing Vietnam maybe? ), I never understood why someone would willingly enlist in the military. I will say what has definitely changed for me personally post 9/11 is my admiration and respect for our military – men and women who give all for our nation, unselfishly. I say thank you any chance I get to any men or women I see in uniform. Jalal, I appreciate your thoughts. I know that I try hard to live in the moment, especially when I’m with my children. A day we all should never forget. My thoughts and prayers to those who lost their lives that day and the families they left behind. I was still in the Philippines when I saw in horror the towers crumbling down to the grown, of people jumping out of windows, of tears and cries that linger in your thoughts. Thank you for sharing this post. More than ever we all need to work as one nation with one heart, one soul. Good will prevail over evil when we all strive to be vigilant and work for it. I appreciate your comments. Your last two lines say it all. We must be vigilant and work for good, whatever our religious or political differences are. But, my breath catches in my throat imagining the depth of sadness evil brought about. Thanks for sharing your thought. I didn’t know how to answer #4, so I’m going to pass along “Turmoil” as a reason people come together. I definitely feel that my patriotism has increased since 9/11, and stand with a hand over my heart and sing the national anthem when its played. I agree with your second comment. The song “Imagine” by John Lennon comes to mind. I can’t say rebuilding the towers is the first thing I think about, especially in an economy where many people don’t have jobs. But we can’t let the terrorists win. 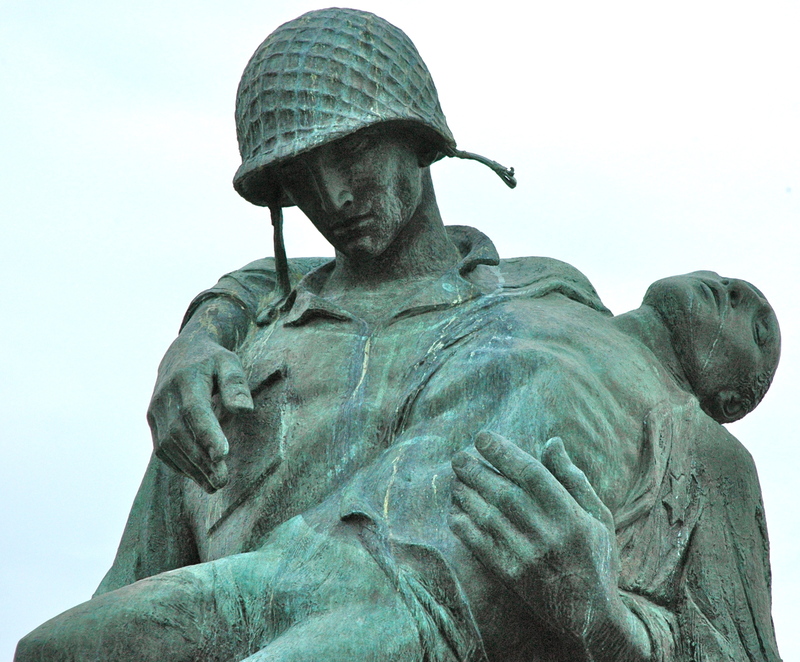 They helped usher fear into this country. But faith can trump fear. I still get choked up thinking about 911. A very thought provoking article and blog. I appreciate your comment. 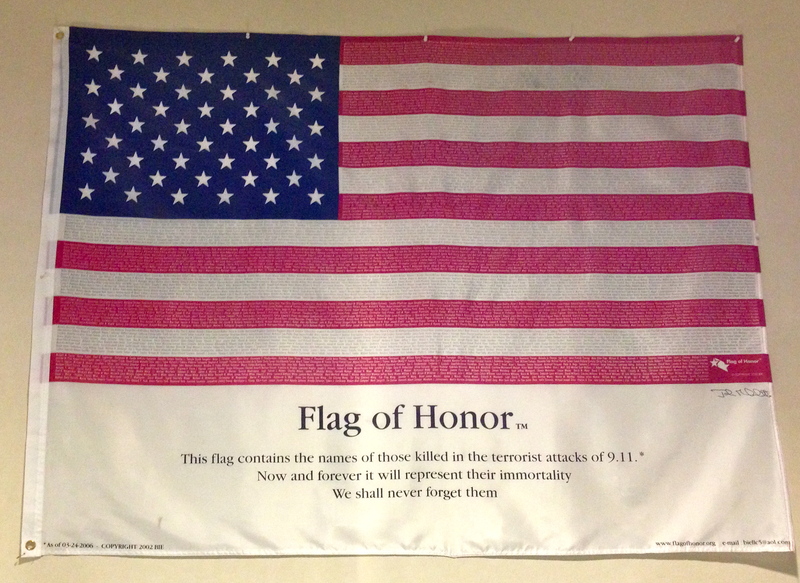 The Flag of Honor stopped me in my tracks when I saw it at the Durango, CO airport this summer. Great post, Naomi. My life completely changed after 911. I no longer wanted to be in a career that brought little meaning to my life. So I left steady consulting work in Human Resources to write children’s books. I had rediscovered writing and found myself. Lyn, and boy have you! Your writing success is an inspiration and I’m so glad we’ve met through a mutual passion.